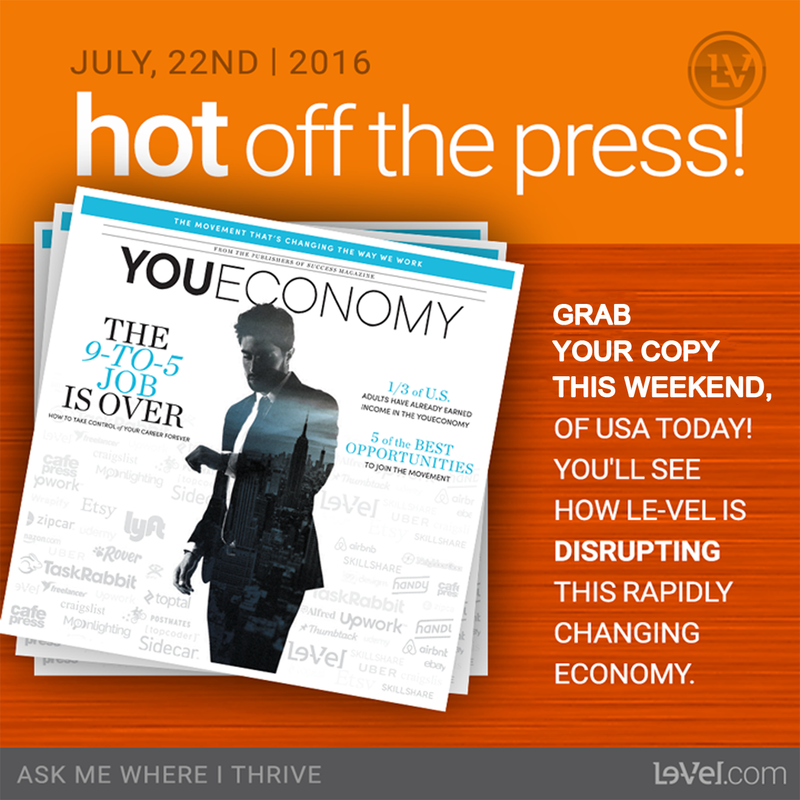 Le-Vel will be featured in an extremely disruptive article that will be published in a supplement, inside the USA Today. This article will discuss the rapidly changing economy, the way business is now conducted and how money is now being earned. Le-Vel Brands, LLC, was prominently seen in USA Today as one of the best ways to create additional income without the hassle of a set schedule and work hours. They focused on what they’re calling the “YouEconomy,” and highlighted several examples of everyday people who are creating their own work schedule from home. The other companies included were Uber, Etsy, Upwork, and TaskRabbit. The article puts a spotlight on the shifting global marketplace trends enabled by technology, and it projects that by 2020 almost half of all US households will be part of the YouEconomy. Wellness brands like Le-Vel, which rely on the power of social media and decentralized Independent Distributors, are perfectly positioned for success in this fast-growing new economy. Le-Vel Brands promotes nutritional wellness products that supplement a healthy daily routine. All of Le-Vel’s products are shipped directly from the company warehouse, which means Promoters don’t ever have to deal with inventory headaches. Le-Vel Brands is a premium lifestyle company offering wellness products via a line called Thrive by Le-Vel, which is based on a premium naturopathic and synergistic formula of vitamins, minerals, plant extracts, anti-oxidants, enzymes, pro biotics, and amino acids. Revenue sales for the company had $350 million dollars in sales in 2015 alone. Le-Vel offers an aggressive and innovative compensation plan for new distributors.